Dear Sir, The AT4 is a joint effort of Saab Bofors Dynamics in Sweden (Combat system development) and Alliant Techsystems in United States (a defense manufacture) to provide a lightweight, manportable, and anti-structure weapon. This is one of the most successful anti-armor weapons that bring the most effective and economical way to achieve one or more of the following objectives: this recoilless rifle can punch a man-sized hole in a solid wall without bringing down the building or can blow up the entire building. 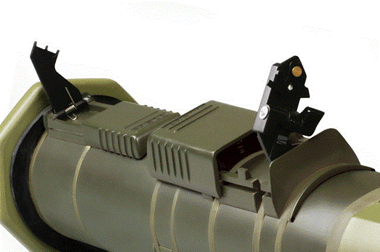 It is also more flexible to eliminate or against stationary or moving targets. DeepFire M136 AT4 project has been running for the past several years and is very successful in building not only an anti-armor weapon replica but with a great performance as the DeepFire M72A2. Our development department utilizes the DeepFire M72A2 launcher system in order to maintain the features of the original real shoulder launcher. We are proud to transfer this great system and excellent technology to the new DeepFire AT4. We follow the exact physical data and properties of the original AT4 so that our AT4 replica has significant advantages for both appearance and function (i.e. overall length, design, materials, etc.). The only differences are this is not disposable and able to launch BB shower shell instead. 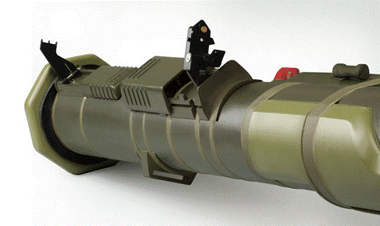 The recoilless rifle replica uses a reinforced smoothbore fiberglass outer tube and a polymer smoothbore barrel. The glass fiber outer tube is a one-piece molded construction in a cylindrical and cone shaped. Fiberglass technology has been applied to the outer tube because plastic is not easy to make a perfectly smooth surface and complex shapes. The fire-through muzzle cover and rear seal are made up of soft rubber for excellent protection. 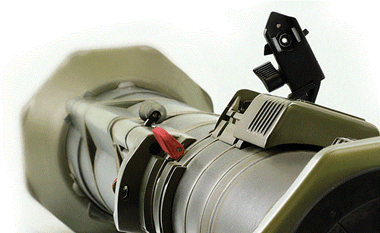 Such powerful weapon always engages the firing and safety mechanism. A person can simply pull out the transport safety pin, push the cocking lever forward (before it was in the SAFE position), hold down the forward safety and press the red trigger. Be sure to read and fully understand all safety instructions shown on the AT4 replica. All these safety and firing features are built-in functions to make sure you enjoy the thrill and excitement of shooting! The color-coded band is the same type of material as the real M136 AT4, which is imported from Germany. Front sight and rear sight will pop up when you press down and pull backward (or push forward) on the sight covers. This M136 AT4 has been serving armed forces in wars for many years. Soldiers have no doubt that it will serve with accuracy improvement and effectiveness throughout the war. After you play with this anti-armor weapon replica, you will love and understand the reason why military adopted this destructive weapon. We would like to share a good news with you today. Our development team has been working on a M136 AT4 project for the past several years. This anti-armor weapon replica will be release very soon. To view more information about this new DeepFire AT4, please follow the link below. If you have any questions regarding to our future release product, please feel free to email us. Thank you!